It's calculated that Colombia has a historic deficit of more than 1000 million dollars, and that’s only the tip of the iceberg. The country also has a long history of failing to invest in public education, as elites prefer a private education system that perpetuates classism and the privileges that allow them to maintain their position on top. This is their way of putting an end to social mobility. This recent student strike is no indulgence, but a response to the historic amount of debt accumulated by universities over more than 25 years. But now, the mobilisation of students and other young people is jeopardising the government of conservative Iván Duque, who only recently celebrated the first 100 days of his presidency. 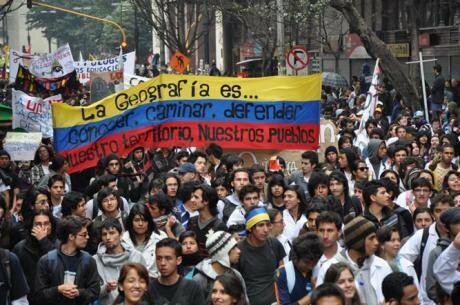 The recent events in Colombia are no exception: student protests have constituted the most common form of political mobilisation in Latin America throughout recent history in the most unequal region of the world. Students are conscious that public education is a fundamental pillar of social development that must ensure equality of opportunity to all within a democratic society. That’s why we analyse some keys to understanding the role of student mobilisations in Latin America. Students have always been active subjects of political mobilisations, taking to the streets to exert pressure on governments when the time has come to create public policies and invest in education. Up against dictatorships, injustices and inequality, student protests have been from the very beginning an opposition movement across Latin America. Students have become actors in the fight for democracy, human rights and freedom through their demands and their fight to guarantee access to public education throughout the region. During the last decades of the 20th and the first of the 21st centuries, many victories and defeats in the student struggle have been witnessed. Progress however in countries such as Argentina, Uruguay, Chile and Mexico have been achieved and consolidated as part of the Latin American democratic transformation. In other countries such as Brazil, student pressure forced universities to open up to minorities and to provide opportunities to those coming from disadvantaged social backgrounds. The massacre of Tlatelolco in 1968 and the Night of the Pencils in Argentina in 1976 were emblematic moments in a long history of bloody repression of student movements that have affected the majority of countries of the region. This repression has left scars after brutal murders, disappearances, kidnappings and violent reactions to protests have taken place, to which hundreds of students have fallen victim over the past decades. More recently, student protests in Chile have changed the direction of the policies of the nation by driving reforms in both the academic culture of and the governance of universities, seeing to the needs of an improved level of financing and management. Memories of torture, disappearances, and persecution of student movements during the dictatorship remain alive, and in many cases, they have managed to put a stop to any attempts by the government to repress current movements with force. With the help of paramilitary forces, the repression of protests in Nicaragua has left hundreds dead among the young people organising themselves to oppose the current government. This hasn’t been the case everywhere however, as we’ve seen this year in Nicaragua. The Ortega regime has violently represed hundreds of students and leaders of protests that the country has been experiencing since April of this year. With the help of paramilitary forces, the repression of protests there has left hundreds dead among the young people organising themselves to oppose the current government, forcing many of them into exile. Various organisations in Colombia have denounced governmental repression against the students currently on strike for the past 7 weeks. They indicate that oppression has taken place resulting in injuries and arbitrary detentions on the part of a police force that has been known to abuse its power and authority. However, the government appears to have reacted, and the last mobilisations on the 28th of November that took place with the support of many sectors of the working population who were demanding an increase in VAT, took place passively whilst the police remained at the margins. The leaders of these mobilisations hope to negotiate with president Duque and to obtain real solutions to the finance crisis faced by the universities. Their demands are focused on achieving an increase in the budget for public education, and structural reforms to the public education model of the country. But the government claims this is an issue that simply cannot be resolved from one day to another, given the debt is so historic. Duque has been shielding himself from the protests and doesn’t appear to want to negotiate to reach an agreement and put an end to the strike. Students are aware of the fact that without quality public education that’s accessible to all citizens, a true democracy cannot exist. We are dealing with a phenomenon that has occurred throughout history and throughout Latin America, given that students are aware of the fact that without quality public education that’s accessible to all citizens, a true democracy cannot exist. On this occasion, it is hoped that the force and determination of this new wave of student protests in Colombia can negotiate with the new government, despite the fact that the new administration mostly comprises of politicians trained in private universities, just like their parents, and grandparents, and their great grandparents. The fight goes on.